Also published on http://www.row2k.com on August 19, 2014. Please check out my column “Row ’til You Die” on row2k. Thank you! People say I’m chronically late. I kind of am. I’m usually late for pieces on Tuesdays and Saturdays – or just barely in time. I took a train to NYC a few weeks ago and they shut the door right after I got on. Maybe I was born late. I promised this last article to Ed Hewitt in the weeks after my trip ended, but as life unfolded, things got in the way and it never got emailed. I did, however, write stuff down, and, reading it over, it’s fun to look back. I’m glad I did a final accounting – and even more glad I saved it. Besides, I promised Ed the article. A good rower never breaks his (or her) promise. 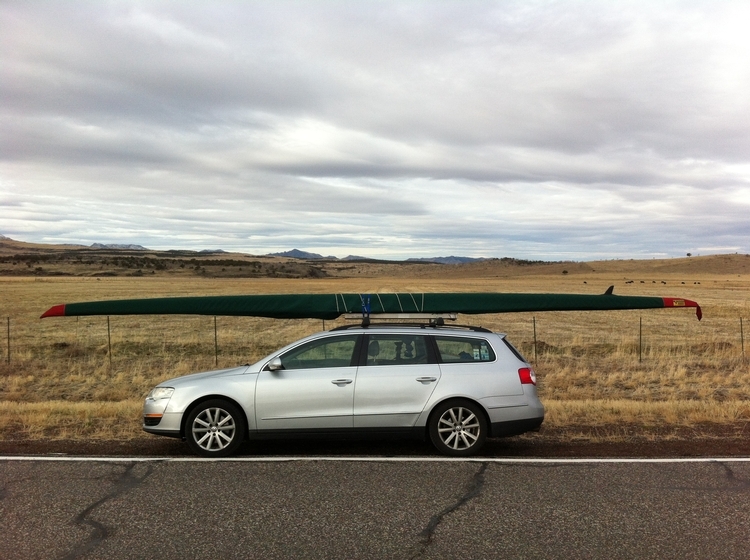 So here it is, sports fans: Some interesting tidbits from The Epic Rowing Road Trip. Which, if you by any chance purged it from your memory, took place from October 27 to December 8, 2012. On the way out, starting in Cambridge, Massachusetts: Massachusetts, Connecticut, New York, New Jersey, Pennsylvania, Maryland, West Virginia, Virginia, Tennessee, Georgia, Florida, Alabama, Mississippi, Louisiana, Texas, New Mexico, Arizona and California. On the way back, starting in Newport Beach, California: Nevada, Colorado, Nebraska, Iowa, Illinois, Michigan, Indiana and Ohio. (Then back home through New York and into Massachusetts, already counted. Miles traveled: almost 11,000. And other than a headlight replacement and an oil change, the VW Passat Wagon required nothing but gas and lots of TLC. Left my beloved Tempurpedic pillow in the Quality Inn in Roanoke, Virginia on the second night of my trip. Never should have brought it with me. I didn’t leave my heart in San Francisco, but I left my slings at Johnny Cash’s lake in Hendersonville, Tennessee. Improvised for the rest of the trip. You don’t really need slings. Closet full of clothes, left at the Cobblestone Inn in Carmel, California. They graciously mailed them back to me (waiting on my porch in Cambridge when I returned). I should have figured out this strategy earlier – a good way to lighten my load. Nuts holding down the right-rear U-bolt on my Van Dusen car rack – loosened and jiggled off, somewhere in The Great Plains on the way home. Drove another 1,500 miles or so with only three U-bolts. Never even noticed, and the boat held steady. Ten paperback novels. Never touched them. Many evenings, I would read a few pages of Thich Nhat Hanh’s “The Heart of the Buddah’s Teaching” before crashing. Also brought Tim Riley’s biography of John Lennon – half read – which I didn’t open, but having Lennon looking at me during the entire trip somehow gave me comfort. Also never used the $30 Walmart tent I bought in San Antonio. Nice tent though. Gave it to my son for Christmas. Cereal bowl, silverware, butane stove, saucepan for boiling water, 2 lbs of Peet’s coffee (ground for French press) and, most of all, the French press. I could, and did, make a cup of gourmet coffee in the middle of nowhere many a time. Butane stove, on which to boil water for coffee. I could, and did, keep milk and cream cold for days and days. I could, and did, have my obligatory bowl of cereal any time I wanted, anywhere I wanted. Dansk sugar bowl and teaspoon – kept in large Ziplock bag. For the obligatory bowl of cereal. Number of times slept in car: Three. Northern Virginia campground (never make a fire before bed – everything smells like smoke for days); truck stop, 30 miles east of Houston; Morro Bay campground. Morro Bay was by far the best. It was like waking up in heaven. State with the nicest people: So many. People are nice everywhere you go, as long as you’re nice to them. State where random people were mean for no particular reason: Texas. State with the stupidest people, based on drivers and random people encountered: Iowa – no question. But then again, I was in a hurry and in a bad mood. State with the best drivers: California – Southern. Hands down. They drive fast (so do I), but they know what they’re doing. State with the worst drivers: Iowa. No question. Illinois truckers a close second. Bane of my existence on the road: Truckers. God how I hated them. I’m convinced that they are bored and like to mess with you. A line of 4-6 trucks are moving along in the right-hand lane. As you approach, the one farthest back moves over to pass the rest of them, and takes forever doing so. He sees you coming, and he waits until you get there before moving over to pass. Then you watch as your $10,000 carbon-fiber boat gets whipped (“bap-bap-bap-bap-bap-bap-bap-bap…!!!! !”) from side to side as a result of the crazy wind from being behind the truck at 80 mph (er, I mean 65). Yes, people, this happened dozens and dozens of times. Over, and over and over. How I hate truckers. 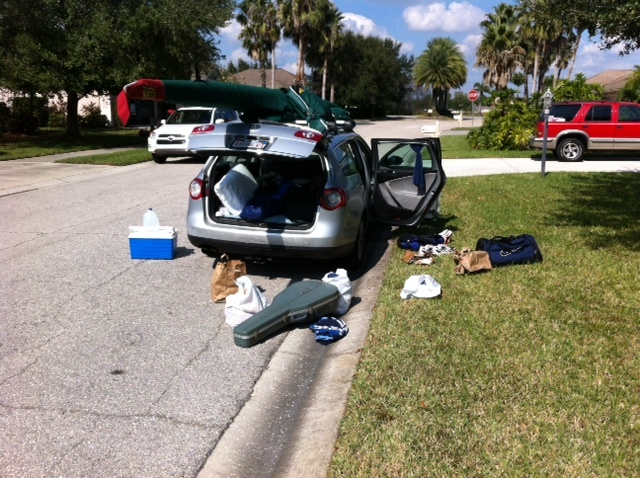 And my boat survived. 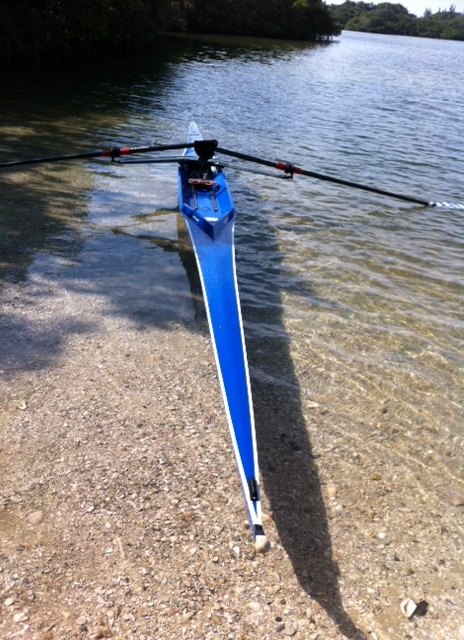 Van Dusen makes a great single scull. Best rows: too many to count. So many highlights: Nashville, Sarasota, canal in New Orleans (complete with alligators), Austin, Newport Beach, Morro Bay, San Francisco Bay. Scariest row: Lake Kaweah outside of Vasalia, California. Storm moving in. Lots of rocks. Big waves and strong, gusty wind. Scary. The alligators were a close second, but I wasn’t really scared until I gave it some thought later that night. 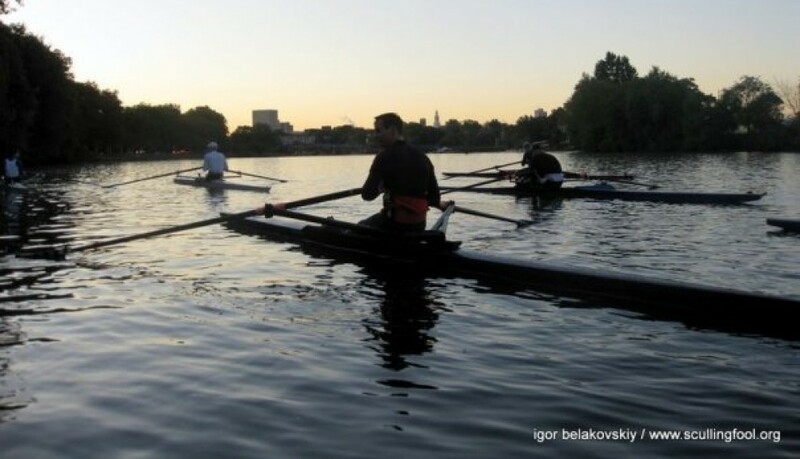 Races: This wasn’t a racing trip, and it certainly wasn’t a training trip, but it was somehow fitting that the first thing I did on the journey was to race at the Head of the Schuykill in Philly, and the last thing I did was to race at the Christmas Regatta in Long Beach. I highly recommend both. 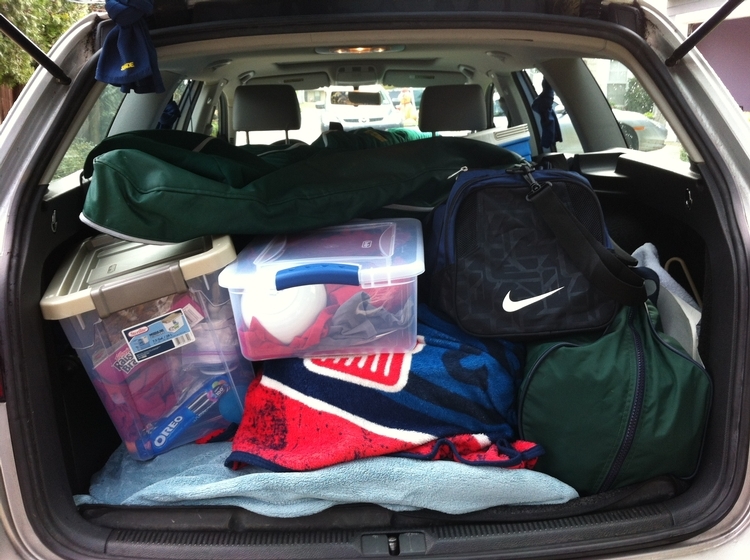 This entry was posted in The Epic Rowing Road Trip and tagged coming, epic, home, john, john tracey, masters, road, row2k, rower, rowing, tracey, trip by John. Bookmark the permalink.